This is located in various places on the island: at the slope of the Montagna Grande, on the top of the Monte Gibele, on the south-eastern part of the Cuddia Attalora, behind the Island (Dietro lisola) and on Ghirlanda. It extends for about 1500 hectars. 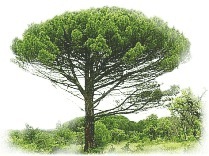 It is mostly composed of marittime pine which is called in local dialect Zappinu and extends for about 850 hectars. Also very common is the Aleppo pine, called locally Deda. The maquis is found everywhere on the island. The most common shrub is the heather, in local dialect Scappucino. The most resistant trees to dry weather are found here. There is plenty of rosemary. The most important garighe are at Sataria and on the precipice behind the island.